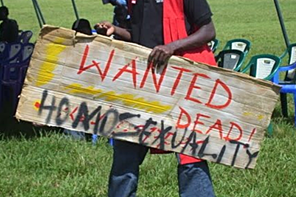 Coming a month after Uganda’s President Yoweri Museveni claimed that his his nation could risk a trade boycott with western countries if Uganda’s draconian anti-gays laws were to be re-instated after being struck down on a technicality. The vehemently anti-gay country is once again drafting new anti-gay laws that in someways mirror Russia’s anti-gay propaganda laws in which anyone convicted of “promoting” homosexuality would be liable to seven years in prison. The Ugandan government could introduce new wide-reaching anti-gay laws before the end of the year, which could see people jailed for up to seven years for “promoting homosexuality”, activists warned on Saturday. The move comes nearly a year after Ugandan politicians passed legislation that could have imposed life sentences on gays. The bill was struck down by the constitutional court on a technicality. According to a leaked copy of the new draft law, MPs have instead focused on outlawing the “promotion” of homosexuality – a potentially far more repressive and wide-reaching measure. Frank Mugisha, a gay-rights activist, said: “People don’t realise that the ‘promotion’ part of it will affect everybody. If newspapers report about homosexuality it could be seen as promotion. My Twitter account could be seen as promotion. All human rights groups that include LGBT rights defence in their activities could be accused of promotion.” According to the draft, anyone convicted of “promoting” homosexuality would be liable to seven years in prison. “We have confirmed that the draft comes from the cabinet. Their plan is to present it to parliament as soon as possible, before the end of the year,” Mugisha said.